Hairy Deer-horn is the young pilose antler of male Cervus nippon Temminck or Cervus elaphus Linnaeus (Fam. Cervidae). The former is known as " Hualurong (sika deer pilose antler)", the later known as "Malurong (red deer pilose antler)". The drug is collected in summer and autumn, processed, and dried in the shade or dried by heat. This TCM herb is indicated in the treatment of backache, impotence, emission, enuresis, sterility, aplastic anemia, senile osteoporosis, senile diarrhea, Raynaud's disease, senile intractable cough and asthma, thromboangitis obliterans, lobular hyperplasia of mammary glands, etc..
Pattern: Tonifies the Kidney, supports yang, supplements Essence, strengthens Tendon and Bone, stops bleeding, astringes leukorrhea. The main chemical constituents of deer horn are estradiol, estrone, cholesterol, lecithin, cephalin, nerve phosphatide. It also contains diversified amino acids such as glycin, tryptophan and lysine. In addition, there're glucosamine, galactosamine, ribonucleic acid, deoxyribonucleic acid, ATP, vitamin A, etc..
lu rong can promote the recovery of arrhythmia of isolated hearts, and increase the myocardial contractive as well. Oral administration of lu rong can increase hemoglobin and reticulocytes in healthy rabbit. In mice, it can lower the blood fat. Gastrogavage of water or alcohol extract of lu rong to the senile mice can lower the monoamine oxidase activity and thus shows an anti-aging effect (Patients with senile dementia or Parkinson's disease often have an elevated activity of this enzyme). lu rong phospholipid can promote the studying and memory function of mice. lu rong powder 1g, san qi powder 0.5g and sheng nei jin powder 0.5g were taken with warm water, twice daily. 13 cases of aplastic anemia were treated with this method, which showed certain effects. Lu Rong Jing Injection, 1~2ml every time for intramuscular injection, once every day or every other day. 11 cases of senile diarrhea due to Spleen-yang deficiency were treated, 10 cases were effective. Lu Jia San (experiential formula): lu jiao pian, chuan shan jia, 60g each; wang bu liu xing, sang leng, e zhu, 100g each; all the drugs were ground into fine powder. 9g, tid. 40 cases of lobular hyperplasia of mammary glands were treated with this method, after three months, 36 were effective. Shen Lu tablet (experiential formula): lu jiao pian 4.5g, yin yang huo 30g, dang shen 12g, suo yang 12g, gou qi 9g. Each tablet contained 6g crude drugs, 5 tablets every time, three times daily, 3 months as a course of treatment. All the treated 32 cases were effective. ma huang, 20g; bei xi xin, 10g, bai jie zi, gan di long, 15g each; lu jiao pian, wu wei zi, kuan dong hua, gan jiang, 10g each; dang shen, 24g, yin yang huo, 12g; shu di, 30g; rou gui, 5g. Modify the formula according to TCM differentiation, water decoction. 50 cases were treated and 48 were effective. 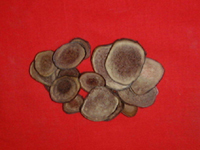 Yi Shen Zhu Yang Tang (experimental formula): lu jiao shuang, 30g; shu di, shan yao, shan yu rou, gou qi, nu zhen zi, tu si zi, she chuang zi, yin yang huo, 15g; huang jing, gui ban jiao, 12g each; rou gui, 8g. With qi stagnation, add he huan pi 12g, xiang fu and chai hu 8g each; with Blood stasis, add dang gui, chuan xiong, and yi mu cao, 10g each. 1 dose every day, water decoction, 1 month as a course of treatment. 35 cases were treated, 33 were effective.